Ed Helms is returning to Comedy Central, and he’s got an agenda. Helms had a stint on Jon Stewart’s The Daily Show more than a decade ago, and continuing his political satire, this time he’s going to give us an hour-long comedy special: The Fake News with Ted Nelms. 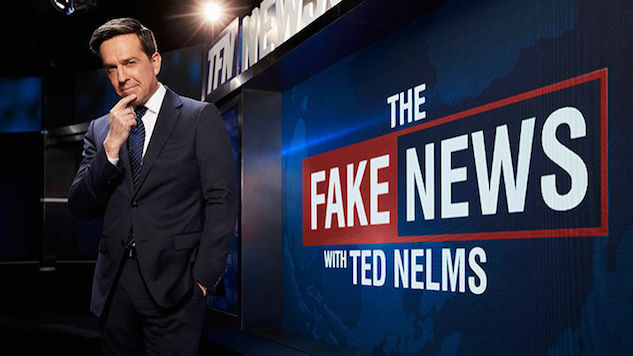 The Fake News with Ted Nelms is exactly what it sounds like; ridiculous, made-up news that closely resembles actual news, delivered by a ridiculous, made-up anchor who closely resembles Ed Helms. It’s a fast-paced one-hour special that looks like CNN with the volume off, but with the volume on is a constant stream of jokes delivered with such extreme deadpan gravitas it’ll ruin viewers capacity to watch the real news ever again without laughing. Led by Helms as Nelms, the special skewers the way news is delivered by emptying out the format and refilling it with insanity, silliness, and absolutely no factual content, throwing all its resources into the ongoing national crisis of President Trump getting stuck in an abandoned well. Because this is The Fake News. The Fake News with Ted Nelms premieres Dec. 13 at 10 p.m. EST/PST on Comedy Central.